WEST LAFAYETTE, Ind. 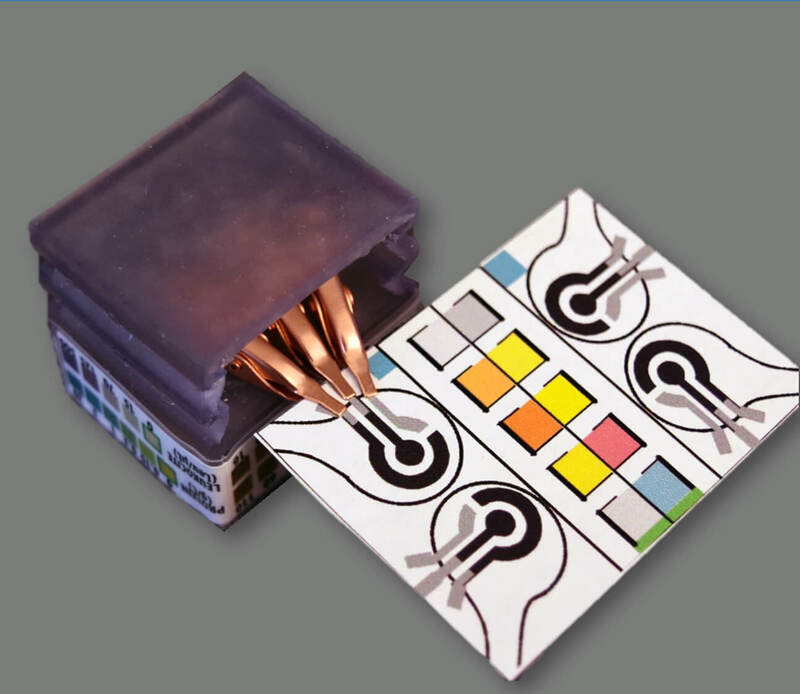 -- A new medical-diagnostic device made out of paper detects biomarkers and identifies diseases by performing electrochemical analyses - powered only by the user's touch - and reads out the color-coded test results, making it easy for non-experts to understand. "You could consider this a portable laboratory that is just completely made out of paper, is inexpensive and can be disposed of through incineration," said Ramses V. Martinez, an assistant professor of industrial and biomedical engineering at Purdue University. "We hope these devices will serve untrained people located in remote villages or military bases to test for a variety of diseases without requiring any source of electricity, clean water, or additional equipment." The self-powered, paper-based electrochemical devices, or SPEDs, are designed for sensitive diagnostics at the "point-of-care," or when care is delivered to patients, in regions where the public has limited access to resources or sophisticated medical equipment. "SPEDs are inexpensive, lightweight, ?exible and easy to use," Martinez said. Research findings are detailed in a paper appearing on Aug. 22 in Advanced Materials Technologies. A YouTube video is available at https://youtu.be/dOBTO8ScTe8. The test is initiated by placing a pinprick of blood in a circular feature on the device, which is less than two-inches square. SPEDs also contain "self-pipetting test zones" that can be dipped into a sample instead of using a finger-prick test. The top layer of the SPED is fabricated using untreated cellulose paper with patterned hydrophobic "domains" that define channels that wick up blood samples for testing. These "micro?uidic channels" allow for accurate assays that change color to indicate specific testing results. A machine-vision diagnostic application also was created to automatically identify and quantify each of these "colorimetric" tests from a digital image of the SPED, perhaps taken with a cellphone, to provide fast diagnostic results to the user and to facilitate remote-expert consultation. The bottom layer of the SPED is a "triboelectric generator," or TEG, which generates the electric current necessary to run the diagnostic test simply by rubbing or pressing it. The researchers also designed an inexpensive handheld device called a potentiostat, which is easily plugged into the SPED to automate the diagnostic tests so that they can be performed by untrained users. The battery powering the potentiostat can be recharged using the TEG built into the SPEDs. "To our knowledge, this work reports the ?rst self-powered, paper-based devices capable of performing rapid, accurate, and sensitive electrochemical assays in combination with a low-cost, portable potentiostat that can be recharged using a paper-based TEG," Martinez said. He co-authored the paper with graduate students Aniket Pal and Debkalpa Goswami; visiting scholars Hugo E. Cuellar and Heloisa F. N. Caurin; and Randy Kuang, a high school student who participated in the research. of various targets for a range of point-of-care testing applications. And they can be used to power other electronic devices to facilitate telemedicine applications in resource-limited settings. The SPEDs were used to detect biomarkers such as glucose, uric acid and L-lactate, ketones, and white blood cells, which indicate factors related to liver and kidney function, malnutrition and anemia. Future versions of the technology will contain several additional layers for more complex assays to detect diseases such as dengue fever, yellow fever, malaria, HIV and hepatitis, Martinez said. Abstract This work describes the fabrication of Self-powered, Paper-based Electrochemical Devices (SPEDs) designed for sensitive diagnostics in low-resource settings and at the point of care. SPEDs are inexpensive, lightweight, mechanically ?exible, easy to use, and disposable by burning. The top layer of the SPED is fabricated using cellulose paper with patterned hydrophobic domains that delineate hydrophilic, wicking-based micro?uidic channels for accurate colorimetric assays, and self-pipetting test zones for electrochemical detection. The bottom layer of the SPED is a triboelectric generator (TEG) fabricated on hydrophobic paper and capable of harvesting electric energy from the user's interaction with the SPED. An inexpensive and rechargeable handheld potentiostat was fabricated to interface with the SPED, enabling the accurate quantitative electrochemical detection of glucose, uric acid, and L-lactate. The battery powering the potentiostat can be recharged by the user, using the sequential discharge of a capacitor previously charged with the TEG built into the SPED. A machine-vision diagnostic application was created to automatically identify and quantify each of the colorimetric tests from a digital image of the SPED, taken under a wide range of ambient light conditions, in order to provide fast diagnostic results to the user as well as to facilitate remote expert consultation. Note to Journalists: The research paper is available at http://onlinelibrary.wiley.com/doi/10.1002/admt.201700130/full or from Emil Venere, Purdue University News Service, 765-494-4709, venere@purdue.edu. A YouTube video is available at https://youtu.be/dOBTO8ScTe8. Other multimedia materials are available on Google Drive at https://goo.gl/X7FoQ2. The materials were prepared by Erin Easterling, digital producer for the Purdue College of Engineering, 765-496-3388, easterling@purdue.edu.